Hello Friends!! In this article we are focusing on Generating Wordlist using Kali Linux tool Cewl and learn more about its available options. 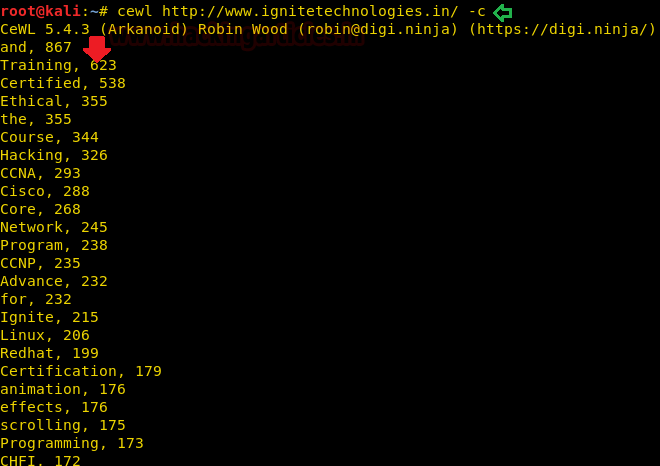 CeWL is a ruby app which spiders a given url to a specified depth, optionally following external links, and returns a list of words which can then be used for password crackers such as John the Ripper. 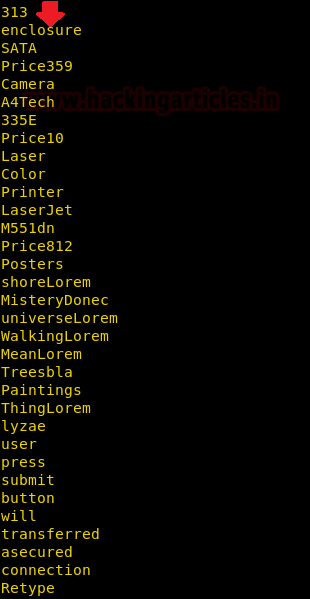 CeWL also has an associated command line app, FAB (Files Already Bagged) which uses the same meta data extraction techniques to create author/creator lists from already downloaded. Type “cewl -h” in the terminal, it will dump all the available options it accepts along with their respective description. -d ,--depth : Depth to spider to, default 2. -u, --ua : User agent to send. --email_file : Output file for email addresses. 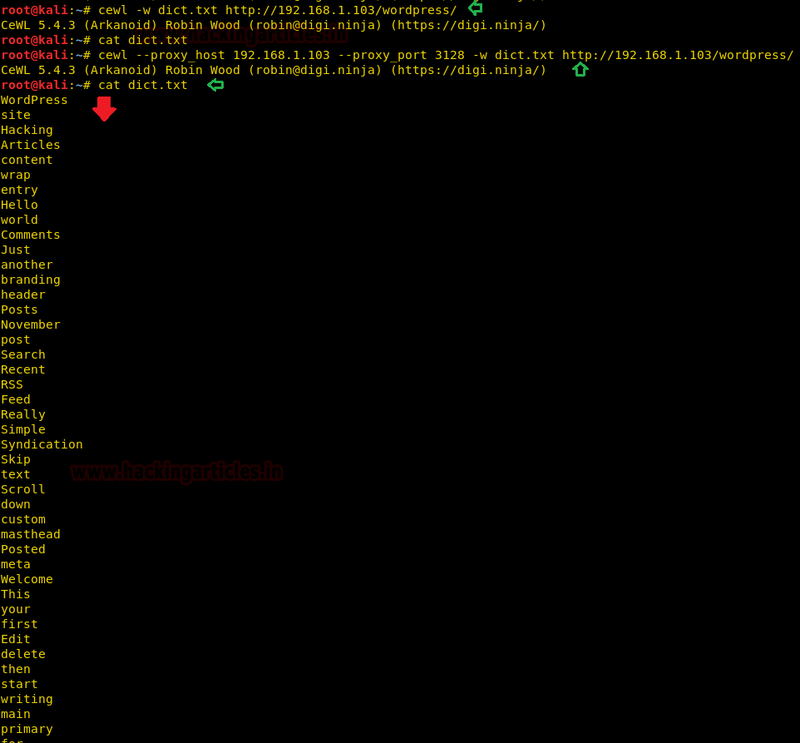 : The temporary directory used by exiftool when parsing files, default /tmp. 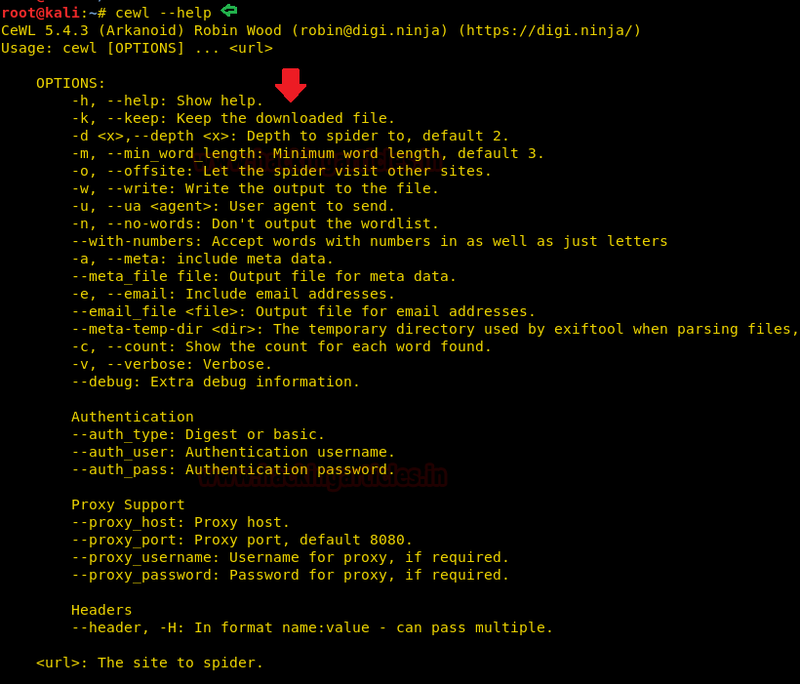 Enter the following command which spiders the given url to a specified depth and print a list of words which can then be used as dictionary for cracking password. For the purpose of the record maintenance, better readability and future references, we save the print list of word onto a file. To this we will use the parameter -w to save the output in a text file. Now that we have successfully executed the command, now let’s traverse to the location to ensure whether the output has been saved on the file on not. 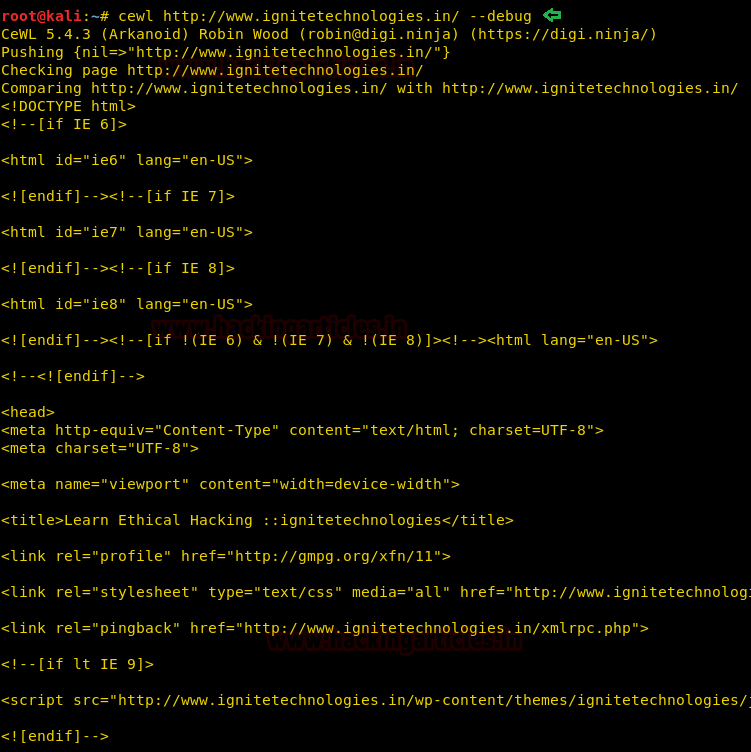 In this case our location for output is /root /dict.txt. If you want to generate wordlist of a specific word length then use -m option as it enables minimum words limit parameter. 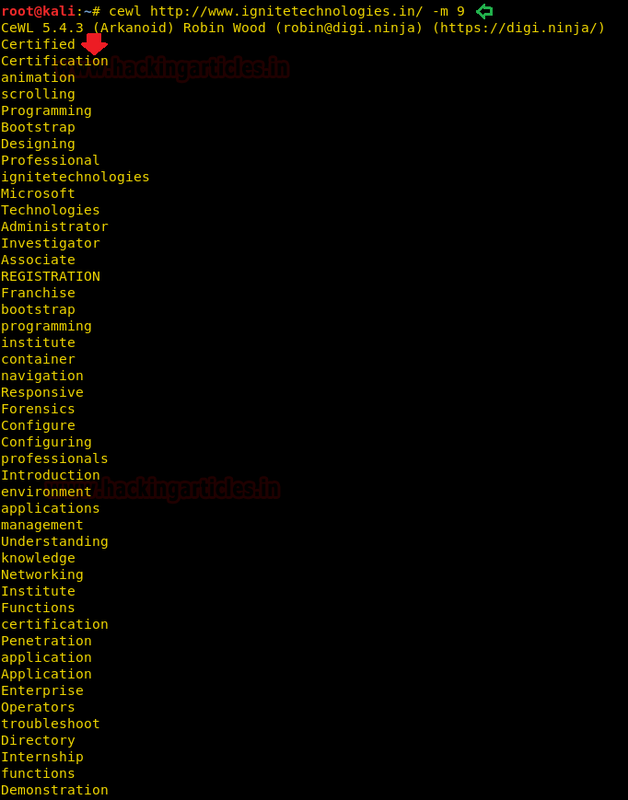 The above command will generate a list of minimum 9 words, as you can observe in following image, it has crawl to the given website and print the list of word with minimum 9 characters. You can use -e option that enables email parameter along with -n option that hides the list of word generated while crawling the given website. 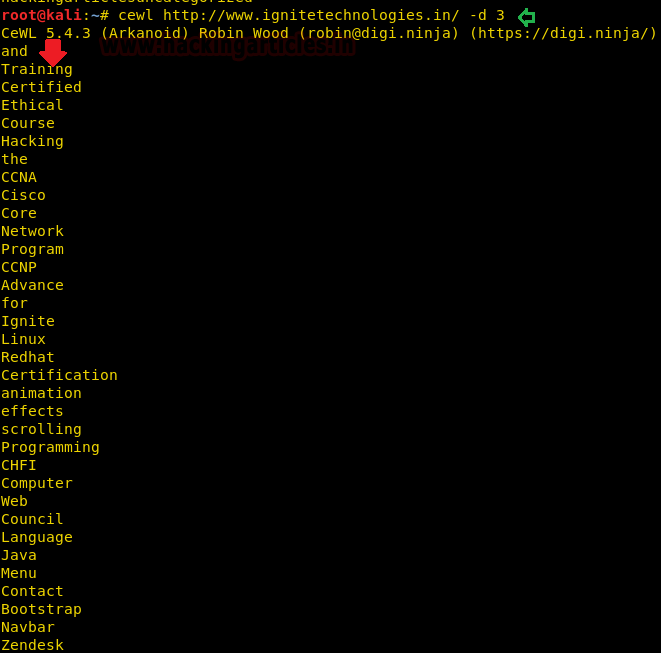 As shown in the below image, it has successfully found 1 email-id from inside the website. If you want to count the number of words repeated several times in a website, then use -c options that enables count parameter. As you can observe from the given below image that it has print the count for each word which is repeated in the given website. If you want to increase the level of spider for generating larger list of word by enumerating more new words from the website then use -d option along with depth level number that enables depth parameter for making more intense creeping. By Default it the depth level set is 2. You can use -d option that enables debug mode and shows error and raw detail of website while crawling. To expand the website crawling result and for retrieving completed detail of a website, you can use -v option for verbose mode. Rather than generating wordlist, it will dump the information available on the website. If you want to generate an alpha-numeric wordlist then you can use --with-numbers option along with command. From the given below image you can observe, this time it has generated an alpha-numeric wordlist. 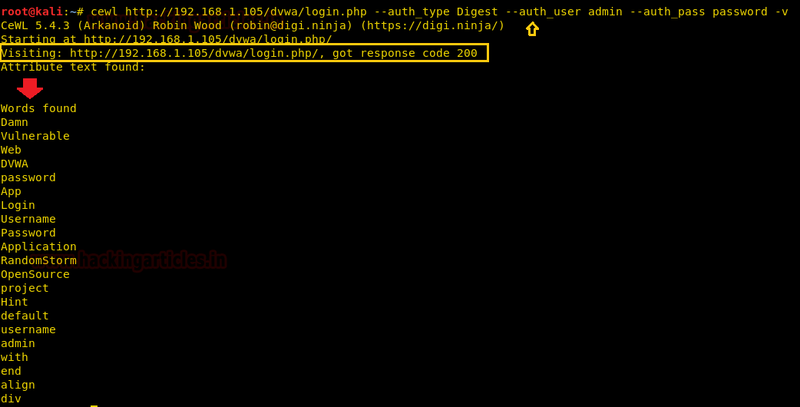 From the given below image you can observe, it has got http-response 200 and hence generated the wordlist. 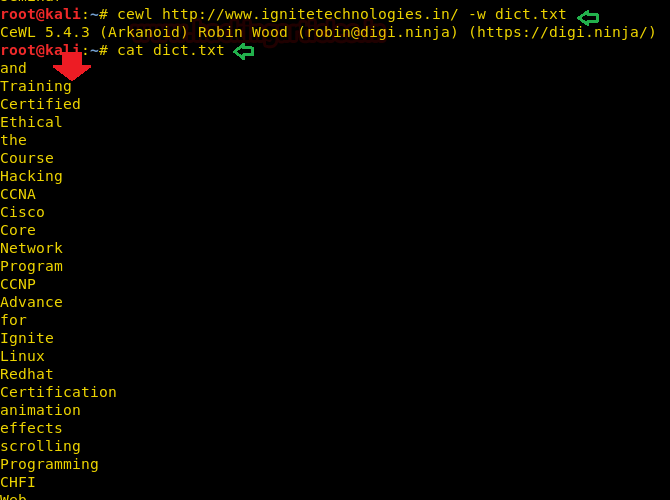 When any website is running behind any proxy server then cewl will not able to generate wordlist with the help of default command as shown in the given below image. 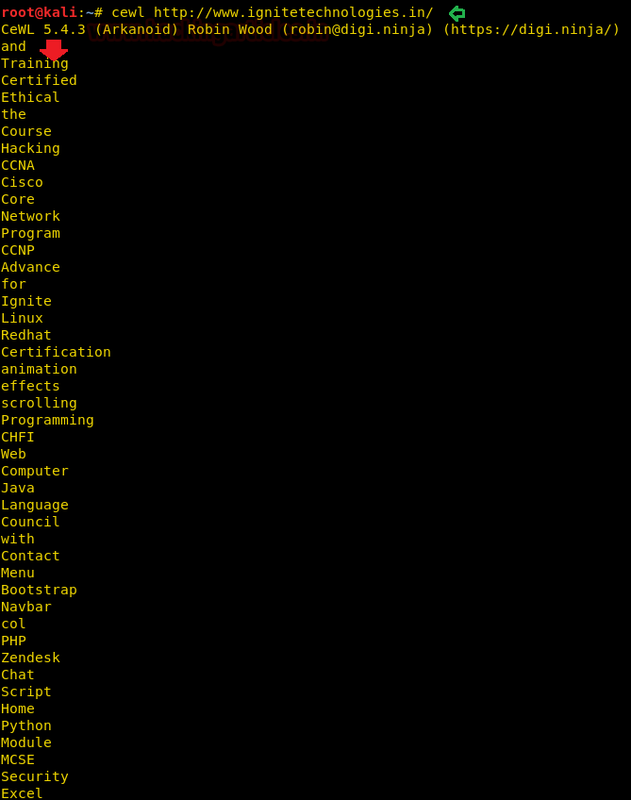 As you can observer in the given below image after executing 2nd command, it has successfully print the list of word as output result.